VAN HOOK – Fishing is always fun, but some days on the water are more rewarding and meaningful than others. That was the case Aug. 8 at Van Hook for the second annual Warriors on the Water fishing event. The event paired U.S. military personnel, both active and veterans, with volunteer fishermen who relished the chance to take one or more of this nation’s warriors fishing. According to event organizer Aaron Donamaria of Minot, 30 boats participated. “This is 100 percent success. I love it!” said Donamaria while watching the veterans gathered around the fish cleaning station at Van Hook. “Everyone around here had a great time.”. The smiles on the faces of veterans and volunteers, the congratulatory handshakes and the constant hearing of “thank you” delivered with complete sincerity, confirmed Donamaria’s observation. A big plus for the day was the weather. No one had to worry about fighting the elements. The day was hot but with very little wind, making for near perfect conditions on the water. Some of the boats stayed in the upper portion of the Van Hook arm. Others made the trip much farther south on Lake Sakakawea. The near perfect conditions made for a pleasant boat ride but it was the meaning behind the event that really captured the attention of the veterans. Alcox was fishing with Leonard Anderson, Minot, a 24-year veteran of the Air Force, and volunteer Shane Cardinal, Minot. Anderson said he got some training on some walleye tactics but, more importantly, thoroughly enjoyed the opportunity to be on the water in an event dedicated to veterans. Donamaria had two “warriors” in his boat. One of them was his father, a transplanted Texan who served 23 years in the Air Force and was stationed at Minot Air Force Base. He served in the first Gulf War, retiring 10 years ago, and chose to stay in Minot. It was a good day for Ron Donamaria in another way too, as he caught his personal best largest walleye. The fish hit the 4-pound mark on the scale. “I thought I had snagged. It didn’t give. Then I said better get the net over here. This is a big one!” said Ron Donamaria. The other member of the military in Aaron Donamaria’s boat was Dane Steig. Steig saw duty in Iraq in 2005-06. He recognized the importance of the day. 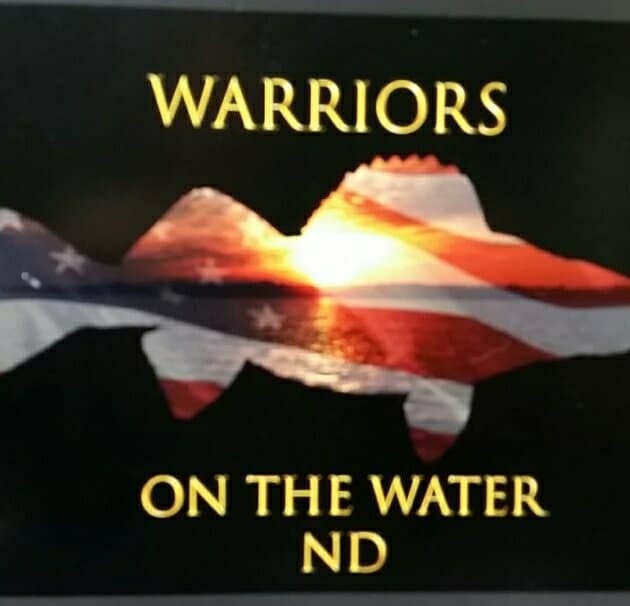 This year was the second for “Warriors on the Water” at Van Hook. It had three times as many boats and participants than in year one. Several of the participants and volunteers indicated they would definitely put the event on their calendar once again in 2016.